Is Kenny Gamble Building a Muslim-only Enclave in Philadelphia? 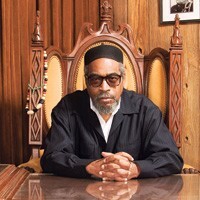 Kenny Gamble, or Luqman Abdul-Haqq, founder and chairman of Universal Companies. Luqman Abdul-Haqq, affectionately known in the wider community as "Kenny" who, although Amir of the Philadelphia-based United Muslim Movement, is referred to in the Muslim community simply as "Brother Luqman". To see Brother Luqman take the time to stop and engage everyone, from the common person seemingly undergoing some misfortune, to the array of public officials that he consistently meets with is truly an example of Islamic da'wah at an unprecedented level. To witness the drive, focus and professionalism of Brother Abdur-Rahim is to witness what the work ethic of the Muslim should be. To sum up, Gamble likes to tell listeners, "We are not just here for Universal, we are down here for Islam." Feb. 4, 2008 update: Kenny Gamble's plans for South Philadelphia allegedly have some very high-level, and perhaps even corrupt patronage – from U.S. Department of Housing and Urban Development Secretary Alphonso Jackson, a business friend of Gamble's. In an amended federal lawsuit filed against HUD by the Philadelphia Housing Authority, PHA Director Carl Greene claims that Jackson has threatened the agency's funding after PHA refused to award a vacant lot worth $2 million to Gamble. The dispute between Jackson and the Philadelphia Housing Authority revolves around a city-led revitalization of the once-blighted Martin Luther King Jr. housing project in South Philadelphia. In 1999, Universal Community Homes, a nonprofit urban-development company founded by Gamble, and a for-profit developer, Pennrose Properties, won the first of a series of contracts from the city to develop 236 affordable, below-market units and provide key marketing and counseling services to incoming residents. As an incentive, the builders were to get a key parcel of land where they would develop 19 homes to be sold at full market rates. But the partnership finished only 80 of the 236 units they contracted to build, because Pennrose pulled out of the project early on. … The authority stepped in to help finish building affordable homes and rental units with Universal. But Universal failed to deliver any of the services it had promised, Greene said. The authority concluded that, as a result, it was not obligated to give Universal the vacant land where it planned to build market-rate homes. Greene said Gamble told him in a 2006 meeting that Gamble didn't have to worry about defaulting on the King project, because he had important friends and Jackson was one of them. HUD officials said Gamble socialized often with Jackson. In September 2006, Gamble invited Jackson to visit him in Philadelphia. After the two men swapped stories about mutual friends and local politics, according to a person familiar with the meeting, Gamble gave the secretary a tour of the townhomes that Universal had built at the King project. Gamble complained, while pointing out the adjoining vacant property, that the Philadelphia Housing Authority had never turned over the land to Universal, the source said. As he was leaving for Washington, Jackson asked the regional HUD director for Philadelphia to check into Gamble's complaint with Greene. Greene concludes: "The secretary was determined that we turn over this land to this specific developer. I refused. . . . He didn't have the ability to remove me. So he resorted to these extraordinary measures to extract what he wanted." Loss of federal funding, the PHA maintains, would raise rents for most of its 84,000 tenants and force the layoffs of 250 staffers. Comment: That the Bush administration might be party to developing a Muslim-only enclave staggers the imagination. Feb. 5, 2008 update: Jackson denies all. His spokesman sums up the response by noting that "The secretary is closer to Carl Greene than he is to Kenny Gamble." Over the past 18 months, HUD has cited the Philadelphia agency for a series of alleged shortcomings and is threatening to pull the agency from a pilot program that gives it far greater autonomy over its $350 million budget and various programs. The rebuke would cost the authority millions of dollars a year and would lead to staff layoffs and rent increases for some of its 84,000 low-income clients, Greene said. "It's this kind of planned, deliberate harassment that adds up to retaliation." Also, ominously, we learn that Universal Companies "has government contracts to operate four charter and public schools and provides support services for welfare and public-housing recipients." Mar. 21, 2008 update: The Gamble caper is one instance of the cronyism that prompted two Democratic senators, Christopher Dodd of Connecticut and Patty Murray of Washington, to call for the resignation of Housing and Urban Development Secretary Alphonso Jackson, calling him unfit to run the department. Mar. 31, 2008 update: Alphonso Jackson resigned his position today. His statement did not acknowledge the Gamble problem but news accounts were full of it. May 26, 2011 update: Unrelated to the Muslim-only enclave but indicative of who Gamble is, his Universal Companies partnered with the Philadelphia Mural Arts Program to produce a mural, the "Faces That Shape Us" at Uncle David's Universal Playground, 1504 Catherine Street, Philadelphia. Kenny Gamble's larger-than-life homage to himself. Not only does the mural feature Gamble himself looming over everyone else, but it also includes his wife Faatimah. Not surprisingly, Universal Companies staff and students at his Universal Institute Charter School had to appear for the unveiling. 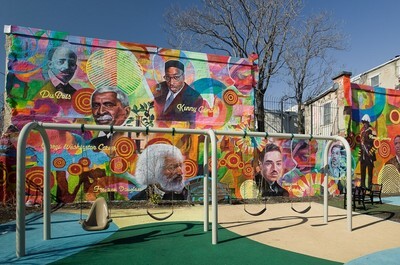 Gamble told the Philadelphia Tribune in reference to the mural, "This is a good thing. This really is a good thing to remind us of the struggles that have taken place to even get to the point where we are today." Always connected, Gamble managed to have Philadelphia mayor Michael Nutter praise Rahim Islam (president and CEO of Universal Companies), himself, his wife, and Universal Companies: "The work that Rahim, Kenny and Faatimah and the entire Universal family is doing is transforming neighborhoods, changing lives, creating opportunity and showing that it can actually be done — neighborhood after neighborhood, block after block, house after house."